The Dream Chair Patio Chaise Lounge With Umbrella features a special floating chaise designed to provide seriously luxurious lounging on your patio or deck. 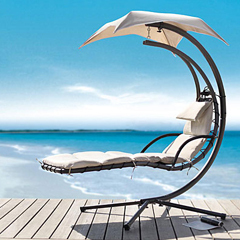 If you’re yearning for some quality lazing time this Summer, you’d best not be without this ultra-comfy Dream Chair Patio Chaise Lounge With Umbrella – as it features a special floating chaise designed for some seriously luxurious outdoor lounging. Letting you literally hang out on your deck or patio, the Dream Chair Patio Chaise Lounge includes a built-in umbrella for sun protection, and a charcoal-colored, powder-coated, high tensile steel frame for strength and weather resistance year-round. Also including body, neck and head pillows made of quick-dry, 100-percent spun polyester, this dreamy chair can be materialized over at Overstock.com for the special price of $369.99 (saving you $129). Hey there! This is my 1st comment here so I just wanted to give a quick shout out and tell you I genuinely enjoy reading your blog posts.